Virginia is just one of two states and the only swing state that hosts a gubernatorial election the year after a presidential campaign. President Trump has weighed in. High-profile surrogates such as Vice President Pence, former vice president Joe Biden and former president Barack Obama are on the campaign trail. And the ad war is on. As the election nears, both Republican Ed Gillespie and Democrat Ralph Northam have escalated their attack ads. Late in September, Gillespie debuted an ad titled “Safer Communities” that stopped short of suggesting his opponent was personally helping the street gang MS-13 to grow. Northam has, perhaps unsurprisingly, knocked Gillespie for his past as a Washington, D.C., lobbyist in an ad titled “Sold” that details how Gillespie “sold out” various constituencies. We often warn readers to be wary of attack ads. So, we dug in. Did Northam cast a deciding vote supporting a sanctuary city policy that benefits MS-13? And did Gillespie make millions by selling out the same people who would become his constituents? Let’s start with Gillespie’s claims about Northam’s policy on sanctuary cities and MS-13. The vote in question was on HB 2000, which aimed to stop any Virginia locality from adopting any “ordinance, procedure, or policy that restricts the enforcement of federal immigration laws.” Essentially, it would prevent any kind of “sanctuary” status in the state. Republicans were in favor of the measure. Democrats said it wasn’t necessary. It is true that Northam, in his capacity as lieutenant governor of Virginia, in February did cast a vote against the bill after the state Senate split 20-20. However, the story doesn’t begin or end there. Majority Leader Thomas Norment (R) initially crossed party lines and voted with the Democrats who opposed the bill, leading to the 20-20 split. This forced Northam to cast a tie-breaking vote. The bill was then returned to the state Senate, and that same day it was brought to another vote. The second time around Norment switched his vote from a “nay” to a “yea.” The House adopted the bill and moved the legislation to the governor’s office. Gov. Terry McAuliffe (D) then vetoed the bill, effectively casting the “deciding vote.” The Virginia House did try to override McAuliffe’s veto, but the effort failed. Immigration and Customs Enforcement can issue an “immigration detainer,” or a request to be notified when a noncitizen convicted of a crime is being released at state or local levels. ICE can then take custody of the offenders and figure out whether they should be deported. Since cities and counties have no obligation to ICE and are not violating any laws by rejecting detainer requests, they accept some requests and reject others, often based on circumstances — an illegal immigrant with multiple assault charges and someone with an unpaid speeding ticket are very different cases. Virginia currently does not have any localities that call themselves “sanctuaries,” a fact that Gillespie agreed with when asked during a gubernatorial debate in July. MS-13 has developed an increased presence in Virginia, but as we’ve previously reported, there is limited research on the link between overall crime rates and sanctuary cities, much less the link to a specific gang. In the studies that do exist, there has been either no statistically significant change or a reduction in crime rates due to immigrant friendly policies. Moreover, many sanctuary cities do cooperate with ICE if they believe that an illegal immigrant accused of a crime is a public safety threat. To add insult to injury, as Think Progress first reported, and The Washington Post later confirmed, images in the ad were from a prison in El Salvador and of a rival gang, Barrio 18, not MS-13. While the use of imagery from different locations might not always be troublesome, this ad refers to a very specific group in a very specific place. Northam did talk about his tie-breaking vote, but the ad refers to Northam’s vote as “deciding,” not “tie-breaking,” which is a key difference. Beyond that, the campaign stressed the growth of MS-13 in Virginia and the threat the gang poses to Virginia communities. Northam’s ad takes aim at Gillespie’s past as a high-powered Washington, D.C., lobbyist and insider. Citing examples from across Gillespie’s career, backed up with citations to news reports, the ad purports to lay out how Gillespie “sold out” various constituencies. The ad begins with portraits of sympathetic-looking college-age students. The voice-over claims that Gillespie lobbied to keep “student loan rates high,” citing a recent article in The Washington Post. Gillespie’s firm did lobby on behalf of several lenders between 2005 and 2007. The article explains that at the time private lenders financed student loans, but the government supported these loans by guaranteeing the debt and paying part of the interest behind the scenes, in an effort to make them more affordable. The private lenders acted as middlemen. Gillespie’s firm represented several of them, including Nelnet, which in 2006 was found to be overcharging the government. But the ad suggests that Gillespie directly pushed to keep student loan rates high, which is misleading. His firm was lobbying to have the system remain as it was, instead of moving to a system in which the federal government directly finances student loans. (The shift eventually was accomplished through passage of the Affordable Care Act in 2010, with no Republican support.) While this might well have influenced loan rates eventually, the firm’s efforts were not focused on interest rates — they were focused on their client’s interests. This is a fine but important distinction that the ad glosses over. When The Washington Post originally asked about Gillespie’s lobbying efforts, his campaign said that Gillespie, personally, had no involvement, despite the fact that his name is listed on the federal disclosure forms. “QGA, the firm Ed left more than a decade ago, had a practice of registering Ed for a majority of its clients because lobbying without registering is an offense, but registering without lobbying is not,” his campaign spokesman, David Abrams, said in an email. The ad goes on to say that Gillespie “lobbied for companies sending jobs overseas.” When we asked the Northam campaign about this claim, it pointed us toward two examples: Microsoft and Hewlett-Packard. Oddly, the images in the ad are not tech workers but factory workers with protective glasses. Gillespie’s company did do business with Microsoft and HP, and both companies were hiring for jobs overseas at the time that he worked with them, but that isn’t the same as lobbying for those policies. In an article cited by the Northam campaign, Microsoft’s chief executive, Steve Ballmer, was quoted as saying an effort to hire in India “would not reduce job opportunities at its operations in the United States.” Indeed, Microsoft in 2001 had a total of 48,000 employees. It now has 125,000 employees — 73,000 in the United States. So clearly the company has greatly expanded in the United States while also hiring overseas, undercutting the ad’s claim that U.S. workers were harmed. The ad then claims that Gillespie hurt workers by fighting to give “billions to Wall Street banks,” citing a 2009 Politico article about the rescue of the financial industry during the Great Recession. This is a particularly tortured claim because Gillespie at the time was employed at the White House, as counselor to President George W. Bush, and he was not a lobbyist. The funds Gillespie was “giving” away were part of the Troubled Asset Relief Program (TARP) created in 2008 by the Bush administration in consultation with both the Obama and McCain campaigns. According to the Politico article the ad references, Treasury officials were “convinced that the fate of the American financial system” was on the line. Consequently, the White House made a coordinated effort across the political and ideological spectrum to ensure a meeting of chief executives from all the major banks went smoothly. Gillespie merits one mention in the article: an email recounting how he persuaded the conservative Heritage Foundation to not attack the TARP program. TARP was also used by the Obama and Bush administrations to rescue the auto and insurance industries. The money has been paid back, with interest — with the bank loans yielding taxpayers a $25 billion profit, according to the Treasury Department. So whatever money supposedly was given away has been returned. The ad concludes saying, “Ed Gillespie made millions selling out to the highest bidder,” citing a 2007 Washingtonian magazine article. But that article is a list of the 50 most influential lobbyists as of summer 2007. Gillespie is listed as No. 8, and his then-partner, Democratic strategist Jack Quinn, is listed as No. 4. The list details how the pair sold the ownership of their company to a larger firm, London-based WPP, and speculated that they each received millions from the deal. It also mentioned a blue-chip client list that included AT&T, Sony and drug companies. The ad creates the illusion that the mere sale of the company or the act of running that company was something much more sinister. It’s reasonable to expect that, like any for-profit company, Quinn & Gillespie would aim to turn a profit. Both camp’s ads exaggerate and manipulate the truth in deeply misleading ways. The link Gillespie and the president create between Northam’s vote, sanctuary cities and increases in crime is a scare tactic and, frankly, fearmongering. Northam’s vote wasn’t decisive. Even if it had been, it would have been irrelevant. Virginia doesn’t currently have any sanctuary cities, and no Virginia cities seem to be moving immediately in that direction. And even if there were some sanctuary localities, there’s currently no evidence that sanctuary policies are in any way connected to increases in crime, much less a rise in MS-13 specifically. Using imagery from outside the United States in an ad about American crime adds inauthenticity to the inaccuracy of this ad. Northam is right that Gillespie was a lobbyist, and that he didn’t always lobby in the public interest. But that wasn’t his job. The ad cherry picks details from Gillespie’s past without adding context. By citing articles, Northam’s ad creates an illusion of truth but ultimately skews what was written. The notion that Gillespie “didn’t care” about workers erases the fact that TARP was used to rescue the U.S. economy — and that American taxpayers earned a profit on that rescue. TARP even saved the auto industry, which certainly employs many American workers. This ad leaves out key facts and details to create a negative impression of Gillespie’s work as both a lobbyist and a government official. 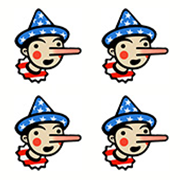 Both campaigns receive Four Pinocchios. Our advice to readers remains: When a campaign ad appears on television, it’s best to ignore it. Ed Gillespie "didn’t care about our workers when he lobbied for companies sending jobs overseas or when he fought to give billions to Wall Street banks." Ralph "Northam cast the deciding vote in favor of sanctuary cities that let illegal immigrants who commit crimes back on the street."